Since when is news of a new Corolla exciting? Right now. That's because it's the 2019 Toyota Corolla sedan that just debuted in Carmel, CA where we experienced the new 2019 RAV4, as well. 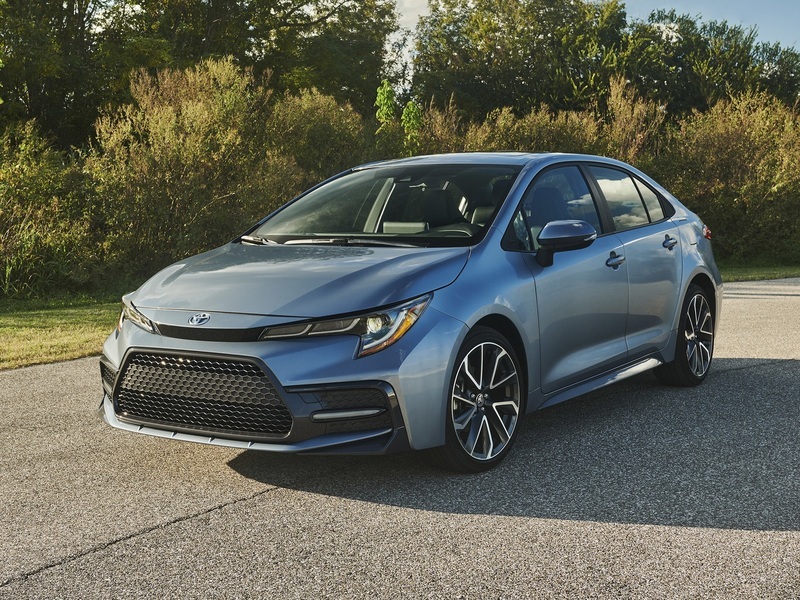 From what we can tell, the new Corolla should be better in just about every way and the Corolla that Toyota really needs right now where sedan sales are slumping. It replaces a car we think is good for folks who don't care about driving but not for anyone else, and the new Corolla sedan does it in dramatic fashion. The new Corolla sedan goes from downright dull to daring. The sedan uses the same TNGA platform as the new 2019 Corolla Hatchback we really enjoyed helming just a few short months ago, and it also shares the same 2.0-liter four-cylinder engine in sport trims, the nearly identical interior, and front fascia styling elements. We thought the sedan wouldn't look as good as the hatchback, but we were wrong. It's a truly attractive small sedan that rivals just about everything out there including the Mazda3, Hyundai Elantra, and the Honda Civic. We like the fact that the body isn't overly creased like the previous version and that Toyota stuck with a more fluid design. The big grille, new headlight signature on sportier trims, and wraparound taillights complemented by the lip spoiler and faux diffuser all look great. Nothing seems overdone. The sedan is a couple of inches longer than the hatchback between the wheels for a bit more rear seat room than the five-door. Though Toyota hasn't released interior dimensions, but space is expected a bit more generous. The front seats are mounted lower for a better seating position, and they can actually move 1.6 inches further back, which is huge. The dash and hood also sit lower, so visibility should be good. If it's anything like the hatchback, drivers will feel much more like they're sitting in the seats versus on top of them, an aspect of the 2018 version we definitely did not enjoy. The whole interior has been reworked for better looks and operation. The interior is pretty much the same as the hatchback's, and that's a very good thing. Though there's nothing revolutionary about the design or styling, everything looks more upscale. The infotainment system floats above the dash, and the weird conglomeration of surfaces in the old car is pretty much gone. There's a look of open space, and styling is simpler. Seating will differ between models. Sport-focused trims (SE, XSE) get sportier seats with more bolstering, while the LE and XLE get basic but still comfortable seats. There's a full suite of safety tech thanks to the Toyota Safety Sense package that comes standard on every trim level, along with Apple CarPlay and Amazon Alexa connectivity, Wi-Fi, a six-speaker sound system and an 8-inch touchscreen on all trims except the somewhat low-rent base Corolla L.
In terms of engines, the SE and XSE use the same 169 hp 2.0-liter four-cylinder engine as the hatch, but the L, LE, and XLE get a revised version of old sedan's 1.8-liter four-cylinder. That engine is less than exciting, unfortunately. No output numbers for the 1.8-liter engine have been released, but there should be a little more power, at least. The sedan will offer a six-speed manual transmission with industry-first rev-match downshifting or a CVT with an actual physical first gear for improved responsiveness and fuel economy. The car will also handle far better than the old sedan thanks to MacPherson struts up front and a new multi-link rear setup that replaces the torsion beam. Better steering, a stiffer chassis, and improved steering should equate to a much-improved driving experience, something the old car was almost wholly lacking. If it's anything like the hatch, it'll be truly fun, if not thrilling. We expect the car to go on sale in mid-2019, which isn't soon enough to see the old car gone from showrooms. The current car is still a great buy for those who want practicality and safety, but if styling, comfort, and driving fun at an affordable price are what you're waiting for, hold out until next year for the new model, for sure.